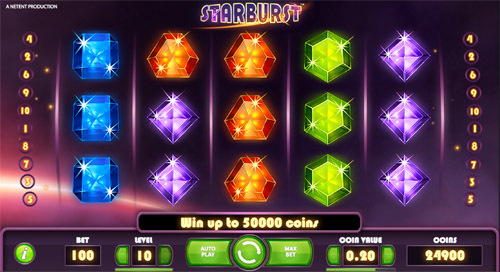 Starburst has grown to be one of the most popular classic themed slots by NetEnt. While most slots with a more classic feel and very few features seem to disappoint, Starburst made its way into the hearts of many players. Starburst was released early in 2012 and until today it’s one of the most played online slots available. The sparkly gems, arcade-like music and minimal features have players hooked. The slot only features Wild substitutions and re-spins but the frequent rewards make it worth the spins. Starburst is a classic slot that comes with 5 reels, 3 rows and 10 fixed bet lines. Coin values range from 0.01 to 1 per bet line. 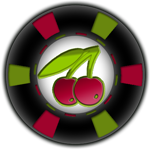 The slot can be played from as little as 10p a spin to a maximum of 100 coins per spin. Beginners or High-rollers can take advantage of this slot and increase their bankroll even from the lowest betting options. 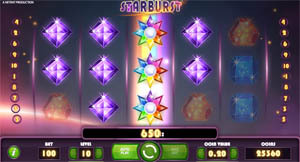 Starburst has been the inspiration behind many slots including Sparks and Dazzle Me, both created by NetEnt. While Starburst only features 10 bet lines, the slot pays both ways. It is playable on all devices and runs smoothly on desktop, mobile and tablet devices. While Starburst might seem short on bonus features players can win a jackpot of up to $50,000! This vibrant, colourful, jewel-covered slot is like a blast from the past with a full on 80’s feel. The cosmic music, space-like background and colourful graphics will instil a childlike excitement in players young and old. Starburst doesn’t come with a lot of bonus features but it is loved by many for a reason. While some players might prefer a more feature loaded slot like Big Bad Wolf others enjoy the simplicity. The biggest challenge in creating a slot with few features is keeping players entertained and locked in. Most players have a tendency of losing interest when a slot doesn’t come with plenty of features. Starburst is one of the special few who manages to mesmerise players and keep them spinning. The Win Both Ways feature isn’t really a big feature but it’s worth the mention as it affects your outcome. The feature provides you as the player with just a little more chances to win. 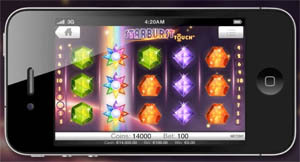 The wild symbol of this slot is the multi-coloured star icon known as the Starburst Wild. It substitutes for all other symbols to provide you with even more chances to win. The wild of this slot can only appear on reels 2, 3 and 4 but it expands over the entire reel. Each time the Starburst Wild expands over a reel the expanding wild re-spins get triggered. The expanded reel will remain stuck in place to ensure a rewarding free re-spin. Players can only get a maximum of 3 re-spins consecutively. Starburst is a non-progressive slot but it comes with a fixed 2,500 coins jackpot. Players who really want a shot at hitting the jackpot should up their ante. As with most slots, the bigger your bet is the higher your chances become of striking that jackpot. Considering the name I wouldn’t be surprised if you expect a candy themed-slot machine, but the Starburst video slot has nothing in common with the famous candy that goes by the same name. If you are looking for a candy slot, you are probably better served with Quickfire’s Fruit Vs Candy video slot. Starburst is a mesmerising classic slot designed by NetEnt and reminds us that the simpler things in life can bring the most joy. Classic slots are often overlooked because of their simplicity. However, Starburst brings colour, life and rewarding wins to your screen. The lack in features might drive some away but most who try it out find plenty of reason to stick around. 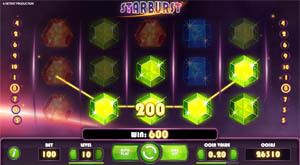 Starburst is a medium variance slot, ideal for players of all expertise levels. You could easily reel in some high wins when playing at the maximum coin value. The slot is a visual delight with a cosmic purple backdrop featuring moving yellow light or stars as some might see it. The high-value symbols are made up out of classic icons like the Bar and a 7. The lower value symbols include 5 sparkly gems in blue, green, orange, yellow and purple. The most beautiful symbol is the multi-coloured Starburst wild. If you’ve played Dazzle Me, Twin Spin or Sparks then Starburst is a must. Not only is it another creative slot with an arcade feel to it, it is also believed to be the inspiration behind the abovementioned slots. If classic slots with gems and sparkle are not for you be sure to check out Gonzo’s Quest, because that slot comes with an Inca theme and nice bonus features. Add a little sparkle to your life and check out this sparkly classic gem from NetEnt. Watch the following demo video. If you want to see more video clips of the Starburst slot, you should check out the Starburst Big Win page, where I collected a couple of big win video clips. Starburst is a bright and radiant slot that seems to be perfect for mobile. It runs smoothly on all Android and iOS devices. There are many players who actually prefer playing this gem on their mobile devices. By using HTML5 software the slot seems like it was specially designed for mobile. The game provides you with superb graphics and sounds and the controls make it easy to play. Playing this beauty on the go will provide one entertaining trip with a burst of colours exploding on your screen. Allow yourself to be mesmerised by the magic of Starburst. The arcade-like soundtrack, the cosmic background and the sparkly gems will brighten your screen. It’s fast-paced and filled with entertaining gameplay. From the very first spin you’ll be unable to tear yourself away from the reels in hopes of landing another Starburst Wild. NetEnt is not known as one of the leaders in the industry by accident. They are known for creating innovative and highly rewarding slots. In the first 5 years of its release Starburst has risen to the top and established itself as a favourite. An added bonus is the fabulous in-game slot jackpot on offer.